Ethiopia’s Genzebe Dibaba broke the world indoor 3000m record with a stunning 8:16.60 run at the Stockholm’s XL Galan, an IAAF Indoor Permit meeting in Sweden on Thursday. 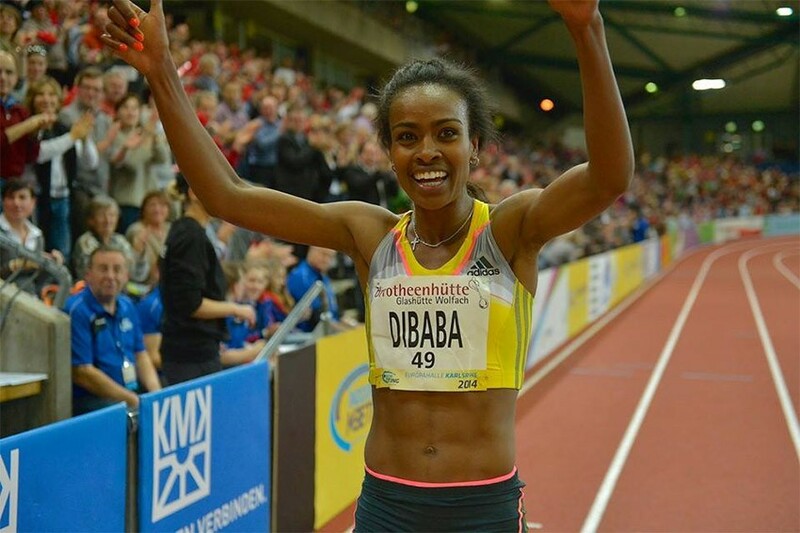 Coming only five days after breaking the world indoor 1500m record with 3:55.17 in Karlsruhe, Germany, the younger Dibaba underlined her piping hot form blazing over 1000m in 2:48.7 and 2000m in 5:34.25 to finally cross the finish line in 8:16.60 - a new African record. Her winning time cut more than seven seconds from the previous World indoor record of 8:23.72 set seven years ago by her senior Ethiopian teammate, Meseret Defar and bettered the 8:23.23 set outdoors by Kenyan Edith Masai in 2002. Kenyan Hellen Onsando Obiri, the reigning world 3000m indoor champion, improved her lifetime best by six seconds to clock a Kenyan indoor record of 8:29.99 in second place ahead of compatriots Irene Jelagat (8:40.75) and Viola Jelagat Kibiwot (8:43.42). Abeba Aregawi, the world 1500m champion, won the women's 1500m in 3:57.91 - an European indoor record with Ethiopia’s Gudaf Tsegay setting a world youth indoor record of 4:08.47 in second place. Ethiopian world champion Mohammed Aman won the men’s 800m, comfortably in 1:45.08, a world-leading mark, ahead of Poland’s Marcin Lewandowski and Spain’s Kevin Lopez, who finished second and third in 1:45.56 and 1:45.69 respectively. Morocco’s Mohamed Moustaoui took the men's 1500m in 3:35.0 ahead of Ayanleh Souleiman, who snatched second place in a Djiboutian indoor record of 3:35.2, with Kenyan Bethwell Birgen third in 3:35.3. Zimbabwe’s 2011 world Outdoor bronze medallist, Ngonidzashe Makusha, won the men's Long Jump with his only jump of 8.18m ahead of home favourite Michel Torneus (8.14m). South African Zarck Visser finished 8th with a best mark of 7.49m. Yomog Meje is a former Nigerian junior athlete and the Associate editor at Athletics Africa.